If you were to pinpoint a breakout moment for the advertising production company B-Reel, it would probably be the release of The Wilderness Downtown, an interactive film produced in 2010 with Google Creative Labs and director Chris Milk. The purpose of the film was to promote Google's nascent Chrome browser, which tech people loved but the masses weren't adopting quickly. As with many B-Reel projects, the early users were tipped off to the film's entry point, a website, by word of mouth—by an influential blog like Gizmodo or because a "You have to check this out" link showed up in their Twitter or Facebook feed. What ensued from there is better experienced than explained, but a simple, mostly white homepage invites you to enter your childhood address and hit Play. After some loading time, the Arcade Fire song "We Used to Wait" begins to play as a second browser window pops up to reveal a youth in a hooded sweatshirt running along a street. From there, an interactive film of sorts, with live action and a flock of animated birds, appears in a series of browser windows that pop up intermittently, seeming to dance to the music. At a certain point it becomes clear that the boy running in one window is the same one viewed in another window from above, in a satellite image taken from Google Maps, and, as the camera zooms and rotates (in sync with the camera on the running kid in the other window), you realize that he is running in your hometown. On your street. Toward your home. The experience was unlike any other on the Internet—in the way it animated the ugly mechanics of the platform (the dancing browser windows becoming part of the film) but more so in that it wasn't just cool, it was emotional. The Wilderness Downtown exploded across the Internet. It was named Best of Show at the South by Southwest Interactive Awards, won the Grand Prix in the Cyber category at the Cannes Lion Awards, and was named Site of the Year by the insiders' arbiter of taste and cool, FWA (for Favourite Website Awards). "I chose it because, of all the entries, here is something that has genuinely changed the game," said one of the FWA judges, Iain Tait, then of Wieden + Kennedy. "In a few short months, it's become the most referenced piece of work that I can remember. And for good reason." One of the most revealing things about The Wilderness Downtown was that it didn't overtly sell anything. If you just walked over and watched it on a friend's desktop, you'd think it was an art project or an unusual music video. The catch: The site was optimized for Chrome, so if you didn't have Chrome already, you were likely to download it to watch once you had heard the buzz. The role of an advertising production company is to execute the vision of agency creatives. Historically, the primary task has been to make commercials, but since the dawn of the Internet as a medium for advertising, some production companies have chosen to specialize in that side of things, in websites and digital films, and—increasingly, especially in the case of B-Reel—to merge these mediums and others into interactive experiences that are more entertainment than advertising. B-Reel's reputation is now such that it really isn't surprising when a prospective client knocks on the door and says, "We want something that's never been done before and that is going to make our brand the coolest thing on Earth." Working with a robotics expert, B-Reel kitted out a Mitsubishi Outlander Sport with robotic controls, so that visitors to the project's website could "drive" the car around a California pier, using keyboard controls. "Literally, that is the brief sometimes," says Anders Wahlquist, a tall, blond, extremely thin man who is the CEO and one of the three Swedish founders of the company, born in Stockholm but now also operating in London, Los Angeles, and New York, the de facto headquarters. What Wahlquist tells such clients is that they have come to the right place. It is rare these days that B-Reel's three founders are in the same city at the same time. Generally speaking, Petter Westlund, the company's chief creative officer, is in Stockholm; Pelle Nilsson is in Los Angeles, focusing on B-Reel's infiltration of the entertainment world through B-Reel Films; and Wahlquist is based in New York. The three men founded B-Reel in 1999 as an advertising/marketing production shop and did, according to Nilsson, "everything you could do within the media and advertising," including traditional ads, TV programming, and digital signage. Sweden was early to adopt the Internet and especially broadband, and as soon as the Web was ready for it, B-Reel was producing content—taking things its people knew, like film and motion graphics, and applying them to this emergent platform. As early as 2000, B-Reel had created a youth channel for the cell-phone maker Ericsson that aired concerts and band interviews live online. Mostly, however, the founders' ambitions outstripped the available technology—and that, as much as anything, explains the hacker mentality that is probably B-Reel's defining quality. "Limitations are frustrating, but they can also trigger a really creative side in you," says Westlund. In 2003, the founders made a decision to wean the company from traditional work. They borrowed against their own houses and shifted the company away from straightforward advertising projects—projects that were paying them good, consistent money—and toward what Wahlquist calls, "a new direction that was more digital." As soon as this new version of the company was successful, Wahlquist wanted to open a New York office, which he did in 2007. Work followed quickly, and B-Reel began making its mark in the United States. In 2008, the company was hired by Goodby, Silverstein & Partners to co-produce Hotel 626, an online project meant to help Doritos revive two discontinued flavors for a limited run that coincided with Halloween. Hotel 626 appeared on the Internet one day, like The Wilderness Downtown, with little explanation. You went to a microsite set up for the occasion, registered, and granted permission for the site to use your webcam and microphone. You were even asked to enter your cell-phone number, not because it would be used for marketing purposes, but because it—like the sound and images captured by your computer—would come into play later in the film/game that subsequently played out on your screen. 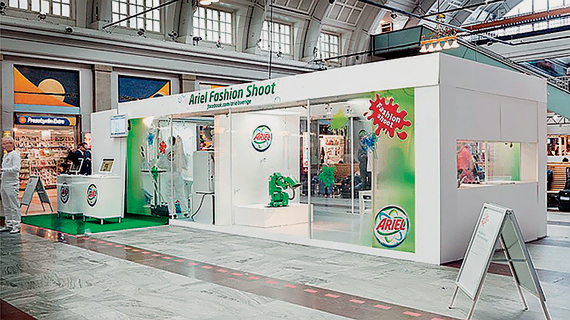 A detergent maker was the client for this installation in Stockholm's Central Station. It contained a "gun" that fired jam, ketchup, and chocolate sauce at sparkling white clothing that passed by on a line. The trick: The gun was robotic and operated by Facebook users in five European countries. In the case of a direct hit, the garment was washed on-site, packaged, and mailed to the shooter. The basic idea was that you—the perspective is first-person POV—wake up in a hotel that is a teeming hell-house of psychos and ghouls. (In a nice touch, the site was accessible only at night, from 6 p.m. to 6 a.m. People who were desperate to play the game during the day would change the clock on their computers.) To find your way out of the hotel, you need to complete a series of challenges that include figuring out the code to unlock a cell you share with a psychotic killer before he snaps and kills you, and singing a demon baby to sleep—also before he snaps and kills you. At one point, you see your own photo hanging from a line in the dimly lit room of a serial killer, and the only way out of the game is to wait for a call to your phone that will provide a few final clues. Hotel 626 was like nothing before on the Web: It was an ad campaign in the form of a hybrid movie/game that you, the user, actually starred in. Your actions had an impact on the story. Hotel 626 became a minor pop-­culture phenomenon that spawned fan sites and YouTube videos. It was played—or experienced or whatever—by more than three million people in 188 countries in its first year, and for two full years after the campaign ended, people were still playing it. As is the case with The Wilderness Downtown, it is hard to characterize exactly what Hotel 626 was. Obviously, it was paying work for a brand. But it was also entertaining enough that people sought it out, spent hours of their free time on it, and came back to it again and again. The industry has since labeled hybrid projects like this "branded entertainment," and, increasingly, thanks to the work of engineers like those at B-Reel, the first word is nearly vanishing into the second. Corn chips were neither shown nor mentioned in Hotel 626. But Doritos moved two million bags of those chips and sold out the entire run in three weeks. The advertising industry, as Wahlquist says, "is normally made out of geniuses." David Droga would be the most recent successful example of a single visionary who founded an agency around his own brand. Before him, there was Donny Deutsch, and before him, David Ogilvy. B-Reel is built on a different model. "We are more like a network," Wahlquist says. "There are so many nodes that are strong in themselves. If one is quitting, the system is still working." Though Wahlquist has the loftiest title, power is shared equally among the three founders, and three is a handy number in case of disagreements. They also own 80 percent of the company, with 10 percent belonging to a minority partner (a sister company called St. Paul Film) and the last 10 percent held by employees. Until early 2012, when it moved into spectacular new digs in Tribeca, B-Reel's New York headquarters was a floor-through loft in a narrow building in SoHo. It was a tight space, filled to its limit with young creative types. Growth has been so precipitate that it was B-Reel's fourth New York office since 2007, and it was so crowded when I first visited that I practically exited the elevator into someone's lap. Wahlquist didn't (and still doesn't) even have a desk. B-Reel built this virtual customer service agent for the European cell-phone company 3. 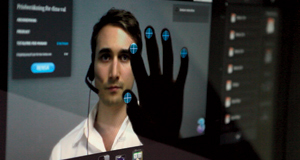 Users log in and interact face to face with representatives, who demonstrate new phones using 3-D models. The reps use mirrors, high-end cameras, and touchscreens to create an experience that looks and feels like something out of Minority Report. He led me into a narrow conference room at the very back of the floor, where we were joined by the executive producer Nicole Muniz, a 28-year-old brunette whose arm tattoos revealed themselves from under her long sleeves whenever she reached for something. She was cheerful and mildly frantic and arrived carrying, in addition to her laptop and some notebooks, two cans of diet Red Bull. You don't drink coffee? I said. She looked at me as if I had asked a very strange question. "I drink coffee, too." Lately, the New York office had been working a lot with Google. It started with some work on the launch of Chrome in conjunction with the agency BBH, which led to The Wilderness Downtown, which Muniz produced. Now there is generally no agency intermediary; the line from Google to B-Reel is direct. Granted, Google is an anomaly. It is so huge and multifaceted that its various components operate almost independently, with their own teams and budgets. Mostly it has been coming to B-Reel to help raise the profile of new products—the Chrome browser, for instance, or new features in Maps or Plus. "They want the developer community to use their products to create art and awesome things," Muniz said. She opened a laptop to show me a few examples of this work. The first, which was a kind of spiritual and technological cousin of Wilderness, was, and still is, top secret. Sorry. The second was a game you might have played by now, Cube. B-Reel engineers had been playing with the code for Google Maps. Now, at the prompting of Google, they used Maps as the base environment for a simple and highly addictive game in which you, the player, navigate a little ball around the streets of New York using the traditional overhead map view. The game is built as a series of levels, each one forming the side of a cube. You control the ball by tilting the cube with your cursor, and once you complete one level—say, you've mastered New York—the cube spins around to reveal a new level highlighting a different feature in a different city. For instance, in London, you roll the ball through the Underground. In San Francisco, you follow bike lanes. When you get through all the levels on the outside of the cube, you go inside and navigate your way through the Mall of America. B-Reel gives great latitude to its engineers and designers to experiment with ideas and technologies, even if there is no client to bill the time to. This results in a steady flow of concepts that can be applied to actual projects. And, in a clever marketing move, B-Reel now posts videos on its website of "experiments." This serves two purposes. It burnishes the company's image as a house for innovation, and it also provides a collection of dangling carrots waiting for the right client to walk by and say, "Hey, can you try that with my product?" We are at a very interesting moment in the world of production, whether it's entertainment or marketing. The revolution in technology has put professional tools in every person's pocket, creating a realm so democratic that any one person can upturn an entire industry. And if you're running a business that competes in this realm, you're cool only as long as you're the one coming up with new ideas. It takes one smart person to do something really great, I said, and Muniz nodded. "And we have 25 of them." B-Reel opened its West Coast business in late 2010. The company had been working with top Swedish directors in Europe for its entire history—even producing feature films back home—and after building a reputation in the U.S. as a laboratory for digital wizardry, it only made sense for the founders to integrate a film division that could make traditional commercials while working seamlessly alongside programmers and designers on projects that required multiple elements. It would also stand poised to produce straight-up entertainment of the kind it was already doing for advertisers. If users were willing to play a game that is really a Doritos ad, might they not also actually buy B-Reel games or download its films? The only way B-Reel's Venice, California, outpost could be more proximate to the ocean would be if it were an encampment of tents on Venice Beach itself. It occupies all three floors of an airy townhouse right on the town's legendary boardwalk, with a rack for surfboards just inside the door. Frank Gehry designed the building and is still the landlord. As executive producer of B-Reel Films, Pelle Nilsson had final say on the location, and two things sold him on this place: the beach, and the fact that employees who live near the beach can walk or bike to work. This was the European in him thinking. 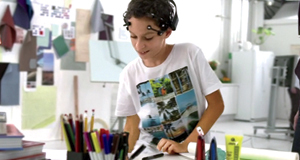 This project, for the Norwegian furniture company Variér, was the first commercial use of what B-Reel calls its "mind control" technology. Software written by B-Reel translated their brainwaves into patterns that became prints on Variér's iconic balans study chair. Nilsson was pleased on the morning of my visit because he was in the final stages of putting together an especially huge film production for a commercial that involved a starlet and a villa rented for the occasion. A monster truck would play a part. It was a commercial of the kind you might imagine from Michael Bay, and the coolest thing about it, Nilsson said, was that this was an ad not for TV but for the Internet. An agency hired B-Reel to assign a top director to a project that would involve a famous star, stunts, and a budget in the seven figures. This made Nilsson very happy; he and B-Reel Films had been building for years to get here. "This is a breakthrough moment, I think," he said. Wahlquist agrees. Until very recently, Web-only productions were all about "virality," which has typically meant cheap and (ideally) clever. "We'd be working with budgets that are less than the director's fee on this shoot," he says. "And now the budgets are equal, finally." The coolest project to come out of B-Reel's new L.A. outpost so far is something called Inside, produced in conjunction with the agency Pereira & O'Dell in San Francisco for Intel and Toshiba. Basically, Nilsson explained, those clients sought to create "the first 'social film,' in which the audience becomes part of the story." (That is, viewers can become characters and not just participants, à la Hotel 626.) Treating the project like a movie, Pereira & O'Dell hired Hollywood director D.J. Caruso and actress Emmy Rossum and then worked with B-Reel to sketch together what was billed as a "social film experiment." An audience of three million was teased, by leaks to blogs, into going to a website on a specific day last July to view a short and very realistic trailer in which Rossum plays the part of a young woman who is abducted and wakes up in a creepy basement, her only link to the outside world a Toshiba laptop left by her captor. "Her fate, and comfort, was left to users," Nilsson says. The connection to those users was through the thing being marketed: the laptop. That's the extent of the promotion. Every day, clues were sent out in various ways—for instance, a photo shattered into hundreds of pieces that had to be reassembled—and fans experienced the story primarily through a Facebook page set up to look as if it was maintained by the kidnapped girl. Different people played the parts of the girl's friends and family, most of them B-Reel employees who worked in shifts to keep up with users around the world who were working (often in groups formed on Facebook) to solve the clues. It took them 11 days to locate the girl. Inside was a step beyond Hotel 626. Here, the users weren't just playing a game; they were actually playing a part in it. "The more interesting companies today are the ones that aren't trying to give you a linear path or narrative," says Carey Head, director of digital production for Goodby, Silverstein & Partners (the co-creators of 626), "not allowing the user to just enter a passive experience, but breaking out the story and making you part of it, in interesting and personal ways." The Inside project sure filled that bill. A few people took it seriously enough to call the police. Another fan made a YouTube video, a well-made trailer that pieces together thoughts and messages from players across America. It was meant as a thank-you to the creators of Inside. Some of the speakers are so moved by the experience that they are crying. PJ Pereira, founder and principal of the agency that enlisted B-Reel to make Inside come alive, says that 50 million people participated at least in some small part (even if they only watched the trailer), and that when he saw the thank-you video, he knew they had all made history. "Getting consumers to thank an advertiser for an ad?" he says. "That's unheard of." Josh Dean is a regular contributor to Inc. He wrote for the December 2011/January 2012 issue about the dog-care company Chris Christensen Systems and is the author of Show Dog.